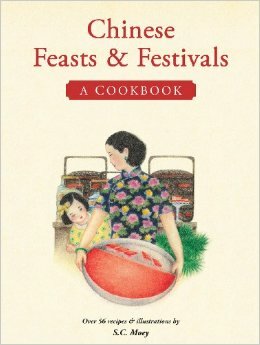 Chinese Feasts + Festivals, by S.C. Moey, available in the US via Tuttle, is about very traditional ways of celebrating the festivals of the Chinese calendar. My first thought when I flipped through the book was that I had been transported back to my junior year abroad, which I spent in Taiwan – and I wished I had known this much then about the culture of the country, not just about the language! I can easily recall the sights, sounds, and tastes the author describes, and they would have been much more meaningful had I had a chance to read about them beforehand. I think those of us who studied in Taiwan in the mid- to late 1980s were exposed to much more traditional Chinese culture than those classmates who studied in the much more recently established language programs in the mainland. Although Communist China, having been “forbidden” to Americans for so many years, seemed much more interesting to many of us, the opportunity to live with a Chinese family was not an option there – students lived in dorms with other Americans, and contact between Chinese students and Americans was still fairly tightly controlled. I feel lucky to have lived with a Chinese family and to have been treated to the feasts S.C. Moey writes about, but with only two years of the language under my belt, even asking the right questions was difficult – much less understanding what the family, who spoke absolutely no English, was trying to convey to me about their holidays – and I was sadly underprepared for this part of my sojourn abroad! The in-depth cultural notes are clearly written with a deep love of the author’s own culture – perhaps, I suggested to my husband (who is from China’s Hunan Province), in an effort to preserve some of the cultural heritage that remains in Singapore, Taiwan, and other outlying Chinese-inhabited countries? My memory of Mainland China was one of communist utilitarianism and a desperate rush toward modernization that left much of the traditional culture behind as something outdated and almost shamefully self-indulgent. But my husband mentioned that in the past decade, there has been a movement to reintroduce many of these festivals and feasts, not only in the countryside – where they have stayed somewhat alive despite the government’s attempts from the 1950s on to shut them down as relics of an undesirable era – but also in the cities. The recipes in the book are well-written and easy to follow, although for a vast majority of the American audience, the thought of buying some ingredients – such as a whole fish that must then be gutted, scaled, etc. – is a bit off-putting! We cook a fair amount of Chinese food at home, and we definitely focus on day-to-day home cooking – although some of the recipes in this book are for dishes meant to be prepared at special times of the year and shared with family and friends who are invited to partake in the festivities, some of them are entirely manageable for weekday dinners, especially with a little forethought when ingredients need to be soaked, etc. In Part I, the recipes are divided into standard cookbook sections (Vegetables, Meat, Poultry, etc. ), but the real riches come at the end of the book: Part II is about specific feast days and the particular foods that are eaten only at those times of the year. Many of these recipes are for items that can be found in Asian markets in advance of those feast days – foods that I never imagined making at home. I’ll admit I haven’t yet attempted moon cakes or salted preserved eggs, but with this book in hand, I may be tempted to try it! The Vital Ingredients section is excellent, providing simple explanations of commonly used ingredients and – perhaps more importantly – simple substitutions that are readily available, even to those who don’t have access to an Asian grocery store. The author is also the illustrator, and the folksy pictures show traditional scenes of Chinese festivals being celebrated and dishes being cooked but rarely of the actual dishes for which recipes are given. I think that in the end, this book will definitely enrich my Chinese cooking classes, and I hope my half Chinese children will spend some time using it to bone up on that half of their heritage! A great purpose for anyone looking to learn more about this part of Chinese culture, particularly those who love to cook and/or teach Chinese language and culture at the elementary and secondary level. « Join us for a 1/2 day workshop!